As if hydrogenated oils (trans fat) and HFCS weren't scary enough, now a doctors group, Physicians Committee for Responsible Medicine, is bringing attention to the carcinogenic PhIP (heterocyclic amines) found in grilled chicken at fast food restaurants. Of course, the best way to bring attention to something is to file a lawsuit, right? So that's what they've done. They're suing McDonald's, Burger King, Chick-fil-A, Chili's, Applebee's, Outback Steakhouse and TGI Friday's because they identified the PhIP in their chicken products. 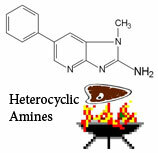 The problem is, these heterocyclic amine (HCA) compounds are found in almost all meats cooked at a high temperatures. They form when amino acids (the building blocks of proteins) and creatine (a chemical found in muscles) react at high cooking temperatures. But heck, let's sue the restaurants anyway! I realize the lawsuit is just a tactic to bring about public awareness of this carcinogen, and it works because here I am writing about it (as did Forbes), but I think it is an abuse of our legal system. The courts are not every special interest group's own public relations firm. If you're concerned about HCA compounds in your food and want to learn about methods for cooking meat that reduce the amount created, please visit this page at the National Cancer Institute. Update: These extremist groups are getting so good at hiding their agendas I almost missed it; this PCRM is just a front for PETA (aka Ingrid's cult). So not only are they abusing our legal system with this lawsuit, but they're doing it under false pretenses. Athough it abuses the legal system it works when you sue them they know there is a problem and it has to be solved so they are not sued again. Big food chains don't want the bad publicity that could cause them to lose customers. Ah, my favorite PETA front, the PCRM. They won't be satisfied until we're all vegetarians. I won't be satisfied until they get some physicians to join their organization. Yet another fake study to subliminally sell the idea of being vegetarian to the public. I wonder if the Cancer place got paid to shovel this crap. Fast Food doesn't cause cancer, radiation does. fast food causes cancer, liver damage, hepatitis c, terrorism, scabies and in rare instances hydrophobia and advanced hysterical pregnancy. it can all be cured by eating raw pork and gargling Chinese chicken blood.